I have a really hard time getting rid of things. I know we’re not supposed to hold on to things, but every small baby and toddler item in my home reminds me of when my children were actually babies and toddlers! Getting rid of a baby carrier, bottle or high chair seems as though I’m going to discard the memory as well. However, I do tend to hold on to things beyond the point where they are usable to me or to anyone else, and that is just too long. A few months ago my husband and I looked around our garage and decided it was just too full. It was overflowing with things we no longer used. One of the items taking up space was a baby swing. It was beautiful and in perfect condition. It had been a gift from my parents on the day my little one, Princess, was dedicated at church, which made it even harder to part with! 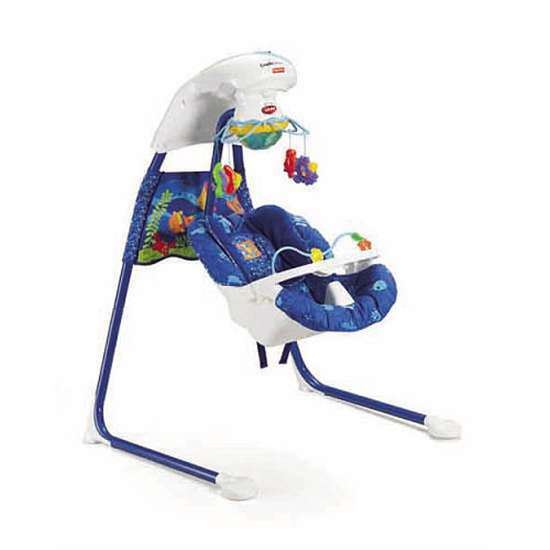 It did everything – played music, made soothing sounds, vibrated, and swung from side to side or front to back depending on baby’s preference. Princess spent some time in it as a baby, particularly when I was tending to one of the other kids or just needed her nearby when we were making dinner or taking care of a household chore. I asked Princess’s babysitter if she could use it and she thought she could – she was going to start taking care of a newborn in the near future. I brought it to her house and was happy to have finally donated something, as well as created a decent space in the garage. Soon afterwards though, the babysitter called to say that she couldn’t use the swing after all – when she tried to open the battery compartment to change the batteries and get the swing working again, it was rusted through. Her husband even tried to get the rust out, but one of the coils that holds a battery broke off, so it was unusable. I ended up picking the swing up and putting it in our bulk trash. I hated seeing that lovely swing out by the garbage can. At that moment I resolved not to hold on to everything beyond it’s useful life. While the swing was a blessing to us, it could have been a blessing to many other families had it gotten passed on while it was in working order, and then continued to get passed down. That same day I started going through the rest of the items in our garage and got them ready to consign or give away – the baby gate, my son’s old little league things, a Barbie scooter, a small toddler riding toy, the Exersaucer, two pack and play cribs, a small stroller that had been used for all three kids, a travel seat given as a gift to me fourteen years ago when my son was born (! ), a scooter still in the box, and bike helmets. I didn’t stop there! I also prepared to part with the bike trailer, which had been used for all three kids, as well as my treadmill, which hadn’t been used in almost five years. I’m not sure my husband could believe what he was seeing as items went into one pile for consignment or a garage sale and one pile for trash if they were already beyond the point of saving. I have plenty of pictures and memories in my head about the great times we had with all of the items I cleared out that day, and now there would soon be room in the garage to properly take care of the things we were currently using. Of course I didn’t clear out or donate absolutely everything – I have a memory box for each child for special things, plus I keep some baby outfits and all their school and sports t-shirts for a future quilt. However, I don’t think I will let baby goods take over quite the same way again! Lord, show me what is really important for my family to keep and what could be a blessing to another. De-clutter one area of your home, whether it be the garage, a closet or even one drawer. What item could be a blessing to another? Pass it on if it has outlived its usefulness to you and your family.